The Indiana Vine system is a service through which victims of crime can use the telephone or Internet to search for information regarding the custody status of their offender and to register to receive telephone and e-mail notifications when the offender's custody status changes. This service is provided to assist victims of crime who have a right to know about their offender's custody status. 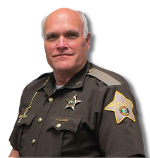 Stay up to date with what the Jay County Sheriff's Department has been involved with recently.